Your contributions are tax-deductible, so please donate generously. 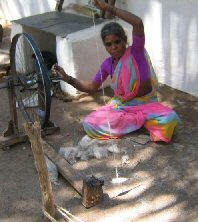 Donations to SHAMA, Inc. continue our many programs in India, helping destitute women and children. Make checks payable to "SHAMA Inc."
SHAMA, Inc. has an account with PayPal, a secure online way to pay by credit card. It is not necessary to create a PayPal account to be able to use their web site. To access PayPal for making donations, click on the donate button below. After clicking on the link, enter the amount in the box. Click on continue link above the credit card logos on the payment page. Your donations support these programs sponsored by SHAMA, Inc. Deepest thanks to all our donors for your tremendous support. Join Giving Assistant free to start donating to Shama Inc. while you shop at places like Macy's, Kmart, & Lowes.